The only aluminum sideboard to use a 1-1/2'x 5' radius outer edge angle to prevent strap damage. 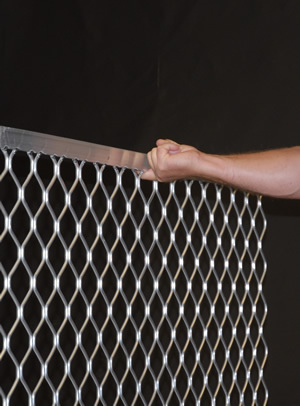 Expanded aluminum mesh sheet welded to our exclusive 1.5" x 5" aluminum angle. The construction industry utilizes many forms of concrete masonry units. When a load of finished goods is positioned on a vehicle at a manufacturing location, it is the responsibility of the transport company to make sure freight reaches the destination point in usable condition. Masons and installation companies rely on timely delivery of product that is in good and usable condition. During the mobilization process of these goods, there are a variety of things that could go wrong. Unique Sideboards is a company that has created tools to assist in the transport function of these concrete masonry units, bricks, patio stones and landscaping blocks. Unique Sideboards has provided sideboard solutions for the masonry trucking industry for the last 17 years. Unique Sideboards has continued to listen to the customer comments by adapting and refining the designs over time. Aluminum sideboard panels are a light weight reusable means of keeping masonry units fastened to a transport vehicle. Light weight aluminum construction for easy lifting and handling.